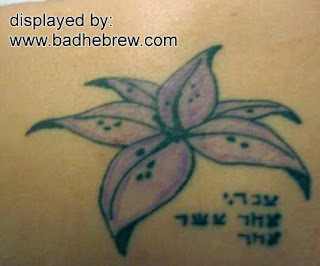 Today we have yet another spiritual Hebrew tattoo. A biblical verse. Whatever could it say? What, you don't recognize this verse? Might be because it's total gibberish. Yes, our poor victim went in for a verse, the ever popular Hebrews 11:1, which speaks of faith and its definition. In this case, her faith was misplaced as this Hebrew tattoo has nothing to do with anything, it's simply comprised of some randomly jumbled Hebrew letters. Even if you don't know Hebrew at all, you can see that all the words in this tattoo are three lettered and differ by the middle letter only. When considering this verse for your tattoo, you should keep in mind that the New Testament wasn't originally written in Hebrew, so this is just a translation. For authenticity's sake, wouldn't it be better to just get it in its original Greek? It says "Ivri, Ehad-asar ehad" which is the literal translation of "Hebrew, 11:1". I was very sure those first letters were all mangled Tsadi, but they're Ayins and Alephs instead. This thing was sitting in my tattoos folder for months, and I never caught on. That's some bad penmanship, eh? Paul sent letters to the Hebrews? Funny, I don't remember receiving them. And a shame, cuz we need some. Only got twenty-two, half of 'em doubles, and useless sofiyot don't count, sorry. well it is in Hebrews- must be in hebrew. the jews believe in jesus, right?? Now that doesn't sound fully "Old testament" either, but given the peculiarity of the specific verse, I think he makes the nicest try.